Step right up! 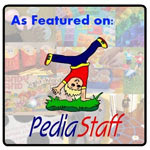 We've got an exciting review and giveaway for you today! That's right, read the review of Electrokite's Carnival Grammar: You're and Your, then try your luck at winning a copy of the app! Great for the classroom as well as in speech-language therapy! You heard me! Best of all, it's aligned to the Common Core Standards! You won't believe your ears! 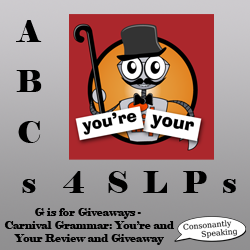 Continue reading for the review of Carnival Grammar: You're and Your and the giveaway of this great application at the end. The application's theme is apparent from the first page. With colors and font playfully showing the carnival theme, click the "Enter" button to head to the next menu. Carnival music will play as an introduction to the application. You will then see a tool bar at the bottom of the page. On many pages throughout the application you will see a robot dressed up in a top hat, cane, and mustache. Press the robot to hear the instructions for the activity. Also, pressing the "Keywords" button will show definitions for the keywords used in the application (your, you're, homophone, and contraction in this app). Pressing on the light bulb button will bring you to the "Explore Page". Here, your student will learn about the words your and you're, how they are homophones, an explanation of how each is used, and shows examples of how to use the words in sentences. Here's where the fun begins. Not only does the student get to practice using the words your and you're in sentences, but carnival game animations play each time the student answers! The sentences are presented in cloze form with blanks for where either the word you're or your is supposed to go. 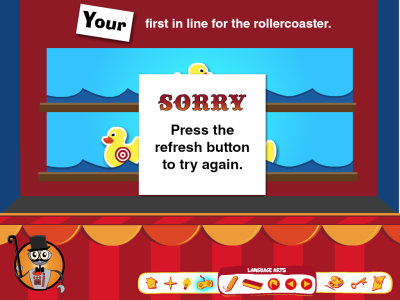 If the student guesses incorrectly, an animation such as of missing the target when a ball is thrown will play and the text "Sorry, press the refresh button to try again" will show. If the student guesses correctly, an animation such as popping balloons with darts will play. These animations all depend on the carnival game shown on the screen along with the sentence at the top. Once the student has completed the sentence correctly, press the arrow pointing to the right to go to the next practice sentence/screen. 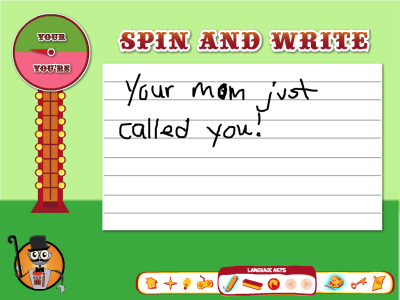 On this screen, there is a spinner showing the word "Your" at the top in the green space and "You're" at the bottom in the pink space. Press the spinner and it will spin around to land on one of the two words. Then, press the pencil tool button to write on the note card to the right of the spinner. If the student makes a mistake and wants to start over, press the eraser tool button. This application is purposefully aligned to the Common Core Standards in which will be adopted this school year. On their application description on iTunes, it states these standards. I would definitely recommend checking them out! The main purpose of this application is for the student to recognize the difference between you're and your and use those words correctly. This application is perfect for using with students who are working on grammatical concepts, in particular homophones and contractions. I love that the carnival theme is shown throughout every aspect of the application from the main page to the music to the practice/game activity. You can work on cloze sentences as well as writing in this application. There are only twenty practice sentences and often when I work on a drill activity with my students, I am trying to get more practice out of them. I would love to not only have an option to see their accuracy on the application as well as more sentences in the future! It all depends on how much time you have to work with this application and whether you are using it for the whole session or part of the session, so twenty might be great! When you press the "erase tool" button, everything that was previously written on the application is deleted. Sometimes, the beginning of sentences written is perfect but a student might make an error on the end of a sentence. It would be nice not to have to have them write the whole sentence all over again and just be able to swipe their finger over the word(s) to erase. The last thing that I mention with most applications is that it would be nice to have sentences read aloud. This way, my students who are having difficulty reading can hear the cloze sentences to choose the best answer. Articulation/Fluency/Voice - Have students read the sentences in the game portion of the application aloud using their good speech sounds, fluency, and vocal strategies. Expressive Language/Grammar - In the practice/game activity portion of the application, have students place the correct word ("you're" or "your") into the blanks in the cloze sentences. In the create activity portion of the application, have students write a sentence using "you're" or "your" (whichever word the spinner lands on. Receptive Language - Discuss the vocabulary used within the application (your, you're, homophone, and contraction). Create flashcards to help them work on learning these words. Finally, have students give an example of each word or state a sentence using each word. Turn Taking - Have students take turns choosing the correct answer to fit the sentence and view the animations. 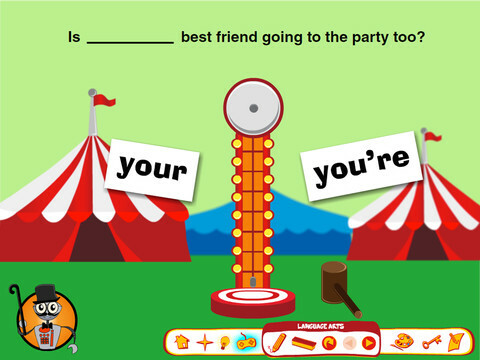 Carnival Grammar: You're and Your is currently available for $0.99 on the iPad. 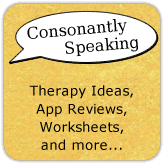 Consonantly Speaking was given 5 application codes from Electrokite to give away along with this review. No other form of compensation was given.